Alojamiento Tico Review 2019: Is Alojamiento Tico a Good Hosting? A Costa-Rican based website hosting provider. With over seven years experience, they’ve designed a suite of premium-priced plans suited to experts and beginners. Alojamiento Tico is a Costa-Rican based website hosting company that has been around since 2006. They currently host over 1,000 websites. Their website and support are available in Spanish, which suggests a primarily South American customer base. They offer a 99.9% uptime guarantee, 24/7 support, and support for advanced scripting languages. 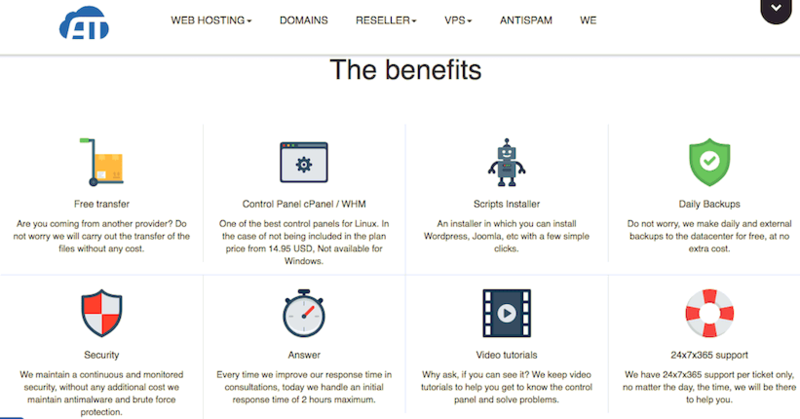 Alojamiento Tico offers a nice selection of website hosting services. They offer shared website hosting, WordPress SSD hosting, domain registration, reseller hosting, and virtual private servers. What I like about Alojamiento Tico is their inclusions for both beginners and experts. For beginners they include a website building tool (at an added cost), as well as a one-click installer for popular programs, and for experts they support a range of advanced scripting languages such as PHP 5, Ruby on Rails, Perl, Python, SSI, Flash, Smarty, and more. They also offer FTP access and SSH access. Ideally, it would be great if they supported PHP 7.2, which is far faster than PHP 5, which they currently support. One concern I do have is that they advertise a 99.9% uptime guarantee, however, they don’t have any terms and conditions that explain what happens in the event that they don’t meet this uptime. Even more concerning is the fact that their terms and conditions are unavailable on their website. They have a link in the footer but unfortunately it doesn’t lead anywhere. Whilst the shared plans have good inclusions for both beginners and experts, they also offer virtual private servers and dedicated servers for if or when your business needs the extra space. Unfortunately, their website hosting plans are expensive and also a little confusing. Some are listed as monthly prices, whilst others are annual. Also, domain registration and SSL certificates are both on available at an added cost. Apart from the features for beginners and experts previously mentioned, as they don’t include information about their data centers or infrastructure, it’s hard to justify the added expense. Their payment terms are also quite strict. They offer one, two, and three-year terms. They do not offer a discount for purchasing a longer term upfront, nor do they offer a money-back guarantee or free trial. Their customer service options are great. They have live chat, as well as 24/7 ticket based support. Their average response time to tickets is thirty minutes. I’ve contacted them at several times of day, usually via live chat, and I have always had a helpful operator. They’ve helped me in English, despite advertising that their support is only available in Spanish. They have a page on their website dedicated to server updates, so you can check in and see if their are any issues with downtime. They also have a large knowledge base with written documents, as well as video tutorials. Alojamiento Tico has over seven years experience in website hosting. They are a 100% Linux based hosting provider, offering SSH access and support for many advanced languages. Wondering how Alojamiento Tico stacks up against other Web Hosting companies? Enter any other Web Hosting company and we will give you a side-by-side comparison.